In Spring the trekking season commences in moderate altitudes. Above 3000 meters spectacular rhododendron blooms. It is also the perfect time for a rafting tour. In Paro, one of the largest monastic festivals – Paro tshechu takes place. The temperature is pleasantly mild even up to the Alp regions. Rain comes only in May as the harbinger of the approaching monsoon. The Summer brings with it the monsoon, but this weather should not deter Bhutan Travelers. 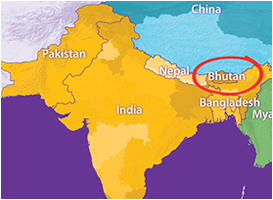 In the settled areas of the medium ranges of Central and Western Bhutan, pleasant summer temperatures without heat or humidity can be found. Rain falls for short periods daily but is manageable with adequate planning and equipment provided by Bhutan tour Operators / Bhutan travel agents like World Tour Plan. Treks in high mountain areas, e.g. the Snowman Trek, are characterized by mild temperatures, verdant green meadows, and pastures of Blue Poppies and Edelweiss. Nomads tending their yaks in the high Alps are a common sight. Autumn is the traditional high season in Bhutan. September and October have the highest number of tshechus (monastic festivals). Trekkers particularly enjoy the clear view of the mountains in October and the low rainfall. Rice harvest means a picturesque landscape remarkable terraces and changing color. In Winter the South beckons. Dry and pleasant conditions make this the best time of year for bird watching in the jungles, village to village trekking in the lower altitudes or a bicycle trip along quiet mountain roads. The trekking routes in the high mountains are covered in deep snow and are impassable at this time of year. The impressive and endangered Black-Necked Crane spends the winter in the high valley of Bumdeling (in eastern Bhutan) and Phobjikha (in central Bhutan).